since they led anyone there? it is – and i walked down them, with nothing to be found at the bottom. Maybe you were meant to walk up them and find something at the top? I was so glad to read your follow-up comment, Beth, because the curiosity about what lay at the bottom was killing me. 🙂 Thank you for starting Sunday with this great meditation about time! I feel that way a lot of the time when I visit old churches that are now too run down to even be tourist destinations. I wonder for how many centuries people poured their dreams into prayers there, imagining themselves to be part of God’s Plan for the future and now it’s fallen to the amoral forces of entropy. and with a guide rail. The stairs make the point exactly. Thanks, Beth. Yes, thoughts I am often having too. How was everything once this or that was just brand new? You found them, Beth, and now others can take the path you reclaimed. 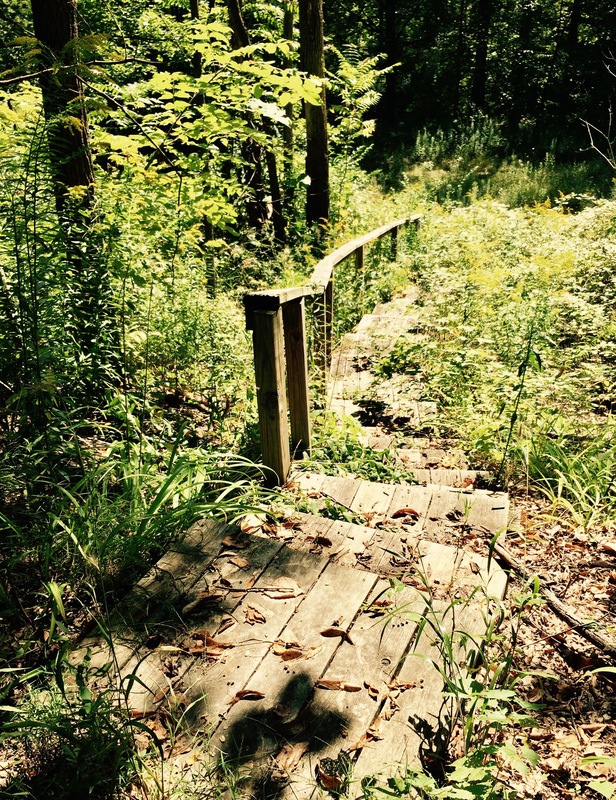 I love coming across stairs on hikes. I love where they take my thoughts. It does make one wonder. Stories can be made from our guesses. Oooooooo… I love this one. When I come up on something like this on a mountain bike trail, I can’t resist to explore. Thank you for sharing the smile-inducing yet some wistful photo, Beth.